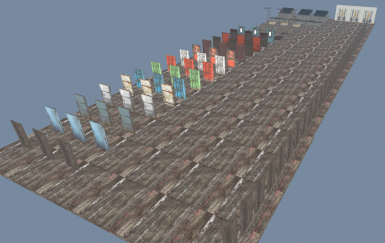 This mod adds 69 placable load doors into the game that each link to its own fully functioning interior settlement and 31 load doors that link to vanilla settlements. Removed 7 of the 10 doors in each section. Only keeping 3 doors of each type. Doors and rooms have been re-named. Room 1 through Room 69. Re-worked teleport script so that it does not use FastTravel command which can fail moving the player if they are in Survival mode. Load doors are now limited to only having 1 placed in the world at any time. Added Vault slide doors and rooms. 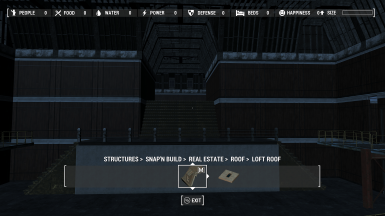 Re-named "Exit Doors" menu section to "Settlement Doors"
Added load doors for each of the 31 vanilla settlements. Added custom menu for FSE Load Doors under "Structure" section of workshop. Made it so that all doors auto close. All 220 rooms should now function just like an outside settlement. READ the installation section for details. ﻿Removed 7 of the 10 doors in each section. Only keeping 3 doors of each type. ﻿﻿This was done so that we no longer exceed the total settlement array size of 128. ﻿﻿Doors and rooms have been re-named. Room 1 through Room 69. ﻿﻿If you have any structures built in rooms that are being removed you will have to blueprint and move them or build again. ﻿Re-worked teleport script so that it does not use FastTravel command which can fail moving the player if they are in Survival mode. ﻿Added "Return Door" to each of the 69 rooms. ﻿﻿These doors will move player back to wherever the room entry door is placed! ﻿﻿These are also the location where you will enter the room and can be moved in Workshop mode. ﻿Load doors are now limited to only having 1 placed in the world at any time. ﻿﻿Placing a 2nd of the same door will delete the 1st one. ﻿Added Vault slide doors and rooms. ﻿Added load doors for each of the 31 vanilla settlements. ﻿Added custom menu for FSE Load Doors under "Structure" section of workshop. ﻿Made it so that all doors auto close. ﻿All 220 rooms should now function just like an outside settlement. Move existing settlers to the room. Send companions to the room. You can do many things with this mod, for example, you make this nice building and then realize you can’t make something like a basement. with this, you can plop down one of the many doors and build that basement you wanted. Or you can build a highly detailed bar with 30 settlers in it to make it lively. It also has the added benefit that your settlers can’t just walk away from the area you want them at when they wander around aimlessly. Or better yet add one of these doors to another one of the settlements added in this mod and connect them all to one another. This mod is publicly available to do whatever you want with including uploading it on other sites or just editing it. I planned on making it a public resource anyways just at least give me credit where do if you do plan on doing it. Enable the plugin with mod managers or the in-game mod menu. Craft and use the FSE Uninstall Chem from the Chemistry Station under the Utility section. Because 0.6 introduces all new cells for each of the 69 rooms, if you already have settlements built using 0.5 they will be lost after updating. Please save your settlements through a transferable settlement mod or you will have to restart them. All 69 rooms tested with brand new save file never having mod before and all work as expected. Tested with having built some settlements using 0.5 and then updating to 0.6. ﻿Teleport point was up in the air and would fall upon entering room. ﻿Door teleported me to one of my old 0.5 rooms. I suspect this is because I had these old rooms from 0.5 in my save file and the new cell used that same location in memory so when teleporting to that cell I ended up in my old room. This is a link to a discord server so you guys can keep in better touch with me and any future helpers of this mod and if you're looking to help also join it as its faster then hopping on here as I get notifications on it unlike here. snap beds beds that snap "warning don't sleep on them"
That is all, now get to building those slave camps I mean workshops.